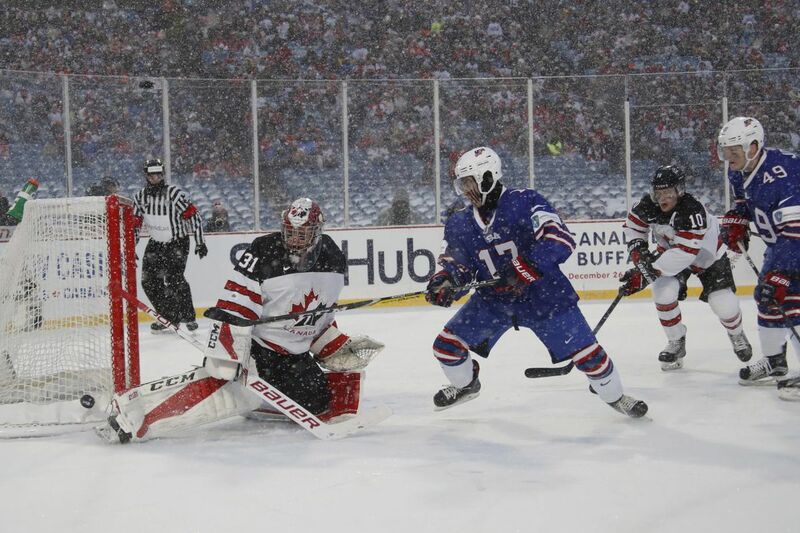 Canada goaltender Carter Hart defends in a matchup against Team USA on Friday in Buffalo. Carter Hart, regarded as the Flyers' goalie of the future, is living up to his expectations. He will lead Canada in a World Junior quarterfinal Tuesday in a 4 p.m. matchup against Switzerland. "You just have to worry about doing your job," Hart, 19, told reporters in Buffalo. "If everybody does that and approaches the game going about their roles, good things will happen." In the tournament, Hart is 2-0-1 — including a shootout loss to Team USA, the defending champion — and has a 1.95 goals-against average and a .929 save percentage. Coach Dave Hakstol has been keeping a close eye on the tourney and the Flyers prospects competing in it. "It's a tournament we've all grown up watching, and enjoy watching just the pure competitiveness of it," he said. "Obviously our four prospects there draw the greatest attention from us." "I've watched parts of every game, and I think he's had an outstanding tournament to this point," Hakstol said. The 6-foot-2, 180-pound Hart is having an outstanding season with the Everett Silvertips in the Western Hockey League: a 13-3-1 record, a 1.32 GAA, and a (gulp) .961 save percentage. He has five shutouts in 17 games. Selected in the second round (48th overall) in the 2016 draft, Hart is expected to play for the AHL's Phantoms next season and, if all goes according to plan, should challenge for a job with the Flyers in 2019-20. The World Junior semifinals will be held Thursday at 4 p.m. and 8 p.m., and the championship game will be played Friday at 8 p.m.
"It's part of the foundation of your development," Hakstol said of the tourney. "It's under a pretty bright spotlight and different levels of pressure come with each of the different countries. If you get into the Final Four of the tournament, you're playing in a real intense environment. That's great in terms of development to go through those experiences and learn how to be successful in those situations." The three other Flyers prospects playing in the World Juniors: center German Rubtsov (Russia), right winger Maksim Sushko (Belarus), and defenseman Linus Hogberg (Sweden). Hart, Rubtsov, and Hogberg are participating in the medal round. Sushko's team is competing in the relegation round. Rubtsov, the Flyers' first-round pick in 2016 (20th overall), has three points (goal, two assists) in four games for Russia, which faces Team USA on Tuesday at 8 p.m.. In Belarus' four games, all losses, Sushko has accumulated one goal and three assists for a team-best four points. He was a fourth-round draft selection last June. Hogberg, drafted by the Flyers in the fifth round in 2016, has not seen much ice time for Sweden and has no points in four games.